"AND WHILE WE WERE HERE"
The target audience for And While We Were Here would seem to be people who liked Richard Linklater's Before... trilogy. Like those films, this one is a talky, character-based romantic drama set against the backdrop of a beautiful foreign locale. The similarities are impossible to deny, yet they aren't necessarily a bad thing, either. If you could compress all three chapters of Linklater's series – with their themes of infatuation, connection, and the struggle to retain meaning in a relationship - into one movie and still have it be good, you'd end up with something akin to this. Kate Bosworth plays Jane, an unhappily married woman spending a few weeks in Italy with her musician husband, Leonard (Iddo Goldberg), who's there for work. We sense the strain in their marriage immediately. The two don't exactly fight, but there's a chilliness between them. While Leonard rehearses, Jane works on a book based on the life of her grandmother, who lived through two world wars. She decides to take a break from writing one day, making a spontaneous trip to the island of Ischia. Here, she meets a young American expat named Caleb (Jamie Blackley). He is charismatic and funny and carefree, a far cry from the dour, serious Leonard. The two hang out on another day, then another, before finally engaging in a full-fledged affair. And While We Were Here is a keenly-observed portrait of a woman in despair. Jane arrives at one of the most beautiful spots on earth in a bad frame of mind. It seems pointless to be in such a romantic city when her husband is both preoccupied and distant. Initially, her sightseeing jaunts are more out of boredom than a desire to see the world. Meeting Caleb opens her eyes, not only to the majesty of her surroundings, but to the unhappiness she's been repressing, as well. We eventually come to learn that there are reasons her marriage has grown cold. Jane starts finding the courage to accept these things, while at the same time knowing that her actions could make it impossible to fix them. When she finally reveals what she wants, it's captivating, as is Leonard's response. Kate Bosworth displays a level of depth heretofore unseen in her work. Jane has relatively little dialogue. Much of the performance requires her to walk and think, and to respond to Jamie Blackley, who is equally strong as a character whose issues are all worn on his sleeve. The actress shows us the wheels turning in Jane's mind, as she weighs what she has, what she wants, and what the difference is between the two. And While We Were Here is the kind of movie that requires you to focus on the faces of its actors. The drama is conveyed in their eyes and their body language. There are no dramatic speeches, just a series of tiny moments that flicker with the revelation of emotions springing abruptly to the surface. Viewers who prefer to have some overt action taking place at every second, or who like things explicitly spelled out, may have little patience for And While We Were Here. On the other hand, those who like to examine characters closely, reading between the lines of their behavior, will be engrossed. Even if it never quite generates the emotional punch of the similar Before... pictures, writer/director Kat Coiro has crafted an intimate study of human unhappiness and the addictive liberation that comes from casting it off. 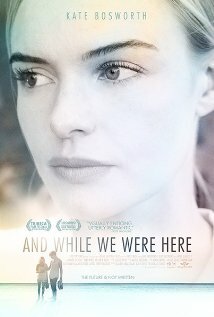 Note: And While We Were Here opens theatrically on September 13. It will be also be available that same day on Cable VOD, Amazon, Xbox, iTunes, Playstation, CinemaNow, Vudu, Google Play, and YouTube. And While We Were Here is rated R for some sexual content, language and brief drug use. The running time is 1 hour and 23 minutes.